Shannon Vaughan, Associate Professor in the Department of Political Science, was elected Vice-President/President-elect of the Southeast Conference on Public Administration (SECoPA) on Friday, October 6th during the annual meeting in Hollywood Beach, FL. 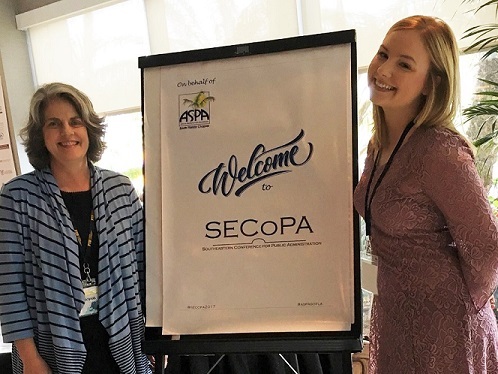 Since 2007, Dr. Vaughan has regularly presented her research at SECoPA (a conference that brings together academics and practitioners who are active in the field of public administration), and has served on the Board of Directors since October 2015. At the 2017 meeting, Dr. Vaughan’s research, Cross-Sector Collaboration: How the Blurring of the Lines between Sectors affects Social Capital, was part of a panel on Social Capital and Collaborative Governance. One of our MPA students, Hannah Benward also presented her research – Navigating the Evolution of a Network: Case Study of a Nonprofit Serving Immigrants and Refugees – as part of that panel.